Here are some of the numbers that helped define the Packers 23-16 win over the New York Giants on October 9. The Packers have been a pretty “average” team when it came to night games over the past few years. Prior to yesterday’s win over the Giants, the Packers were 36-25 since 2000 in games that started after 6pm. They had lost four of their last five, and were 9-9 in their last 18 and 5-5 in their last 10 night games. Green Bay’s first drive of the game was a 16-play drive that took 8 minutes and 42 seconds. It was the team’s second drive of 16 plays or more on the season, and they now have the third and fourth longest drives based on time in the NFL this year (they had a drive versus Jacksonville in Game One that took 9:14). Arizona has the longest drive based on time this season at 9:20. The Pack scored first in the game and has now won five of their last six when they get on the scoreboard first in a contest. They are 46-13-1 since 2010, and are 14-2 when they scored first in their last 16 games at Lambeau Field. Aaron Rodgers had two interceptions in the game; the Packers are now 7-6 in games where Rodgers has multiple picks. Green Bay led 17-6 at halftime. They have now won 16 straight when they have a lead of 10 points or more at half and have won 32 straight at home when they lead at halftime by 10 or more. Eddie Lacy had 81 yards on 11 carries in the game for a 7.4 yards per carry average. In games where Lacy had at least 10 carries, this 7.4 is the second highest of his career in a game. His highest average was 8.1 in a game versus the Vikings in 2014 when he had 105 yards on 13 carries, a per-carry average of 8.1 yards. The Packers had an eight-point lead going into the fourth quarter. They have now won 22 straight when they take a lead of seven points or more into the last quarter. In games at Lambeau, the Packers last lost a game when they took a seven-point lead into the fourth quarter on October 12, 2003 against the Kansas City Chiefs. They lost that game 40-34 in overtime after taking a seven-point lead into the fourth quarter. This was the first regular season game of Rodgers’ career where the Packers won in a game when he had two interceptions and a completion rate under 60%. They were previously 0-4 in those games. The Packers did win a playoff game against the Bears when Rodgers had two interceptions and a completion percentage of 56.7%. Mason Crosby had three field goals in the game for the 34th time in his Packers career. The team is 28-6 when Crosby connects on three or more field goals in a game. Receiver Randall Cobb went over the 100-yard mark in receiving (108 yards to be exact) on nine receptions. Green Bay is 10-2 when Cobb has a 100-yard receiving game. Rodgers was not sacked in the contest in the 45 pass attempts he made. It was the eighth time since 1970 that the Packers did not give up a sack when they attempted 45 or more passes in a game. Most pass attempts in a game with no sacks by the Packers is 59 in 1986. All four of the games this season have been decided by seven points or less (the Packers are 3-1). Last season the Packers played in five games that were decided by seven points or less… they were 2-3 in those games. Green Bay won the time of possession battle with 36:38 to only 23:22 for the Giants. The Packers have won 12 of their last 13 when they have 36 or more minutes TOP in a non-overtime game. 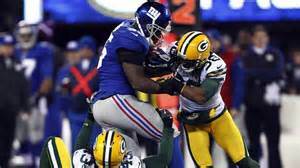 The Packers gained 147 yards rushing in the game and allowed the Giants only 43 yards on the ground. In the history of the franchise, the Pack is 30-0 when they gain over 140 yards rushing and allow the opposition less than 50 yards.